While explaining my last post to my family as they leered hesitantly at the quart of ice cream I brought over, I found myself thinking about my grandfather, primarily because the ice cream combined his two favorite things, crispy bacon and ice cream. We’re a lot alike in our preferences. I decided that for my next post though I would write about something that reminded me of my grandmother, something bright and fun, and pink. Beets. Aren’t they pretty? 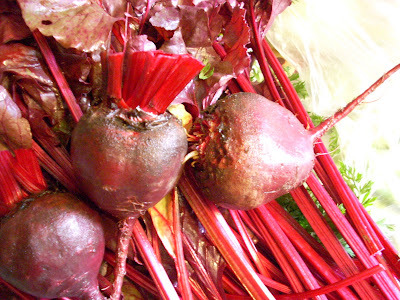 Since spring, we have been bringing home fresh beets every other week or so and have tried a few different dishes featuring this bright root. I can honestly say I’ve enjoyed each one from a beet ravioli dish to beet chips, and this week’s creation, a Chilled Roasted Beet Soup. The soup fit perfectly for the weird Columbus weather this week (sweatshirts already?!). The roasted beets impart a rich savory taste that screams fall, while the chilled and simple delicate puree of vegetables sits well on a crisp light summer palate. As most of my recipes go, the soup itself is simple enough although it takes a little bit of time to achieve the rich, savory taste I was going for. Although I’m sure you could forego roasting the beets and just allow them to simmer until tender with the other vegetables if you don’t have the extra hour or if you’re fortunate to still have some summer weather left and don’t want to heat up the kitchen, but I highly recommend it. Enjoy! 3 Medium sized beets; washed, trimmed. Approx 2 Cups Chicken Stock (Enough to cover vegetables). First, preheat the oven to 400. Coat the beets in olive oil and cover in foil. Place on baking sheet or roasting pan and allow to cook for 45 minutes, until fork tender. Allow to cool. (This could be done before you leave for work or even the night before and allowed to rest in the fridge). Next, peel and quarter roasted beets. Place in medium saucepan with remaining vegetables. Add enough chicken stock (beef would probably work well too) to almost cover the vegetables. Allow vegetables to simmer until all are fork tender. Once tender, remove from heat and allow to cool slightly. Place all vegetables in blender with at least 1 / 2 cup broth. Puree until smooth. Continue adding broth until reaching desired consistency (I used most of mine). Season with Salt & Pepper to taste. Allow to cool in refrigerator before serving (3-4 hours). Before serving, add a splash of vinegar (1-2 tablespoons), and dill for garnish. Oh beets! I think this is one of the most unused veggies. I love them so. What a gorgeous soup you have made.